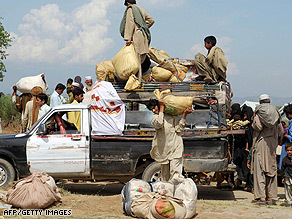 Pakistanis in Swat Valley fleeing violence caused by military clashes with Taliban. (CNN) -- Young and old, poor and prosperous, sick and healthy -- residents of Pakistan's Swat Valley continue to flee the violence that has erupted there as the military clashes with the Taliban. According to the most recent United Nations numbers, about 2.4 million Pakistanis have registered as displaced persons since May 2. Currently, the clashes are concentrated near Mingora, the valley's largest city. But fighting in the valley over the past three years has made people's lives "worse than hell," one former resident told CNN. The 50-year-old man asked that his name be withheld because he fears retribution from the Taliban. He fled Hazara Gul Jaba Aligama, a village 5 miles (8 kilometers) west of Mingora, on Sunday. The Pakistani Army ordered the village vacated, he said, and all the residents from that village and others nearby -- several thousand people -- fled, mostly on foot, although some cars were used. Iftikhar Hussain Shah, 27, a farmer from Union Council Hazara, adjacent to Hazara Gul Jaba Aligama, also recounted the fleeing of thousands. He said the army ordered all five villages evacuated, telling the residents an operation was to take place in the area. His village was already housing people from three other villages nearby, he said. He estimated the total number of those displaced at about 50,000. He said the "miserable condition" of some of the refugees brought him to tears. The group got as far as Chakdara, a town controlled by the military near the southern end of the valley, where a curfew prohibited them from traveling further, the men said. Those displaced have no food or water and are depending on handouts; they have received nothing from the military. Women were staying in two school buildings, Shah said, but men and children were out in the heat with no shelter. Civilians feel betrayed at being told to move, he said, then stopped at Chakdara. The army has been bombing civilian areas from jets and helicopters, said the 50-year-old who asked not to be named. Shelling continues round the clock. Shah said gunshots, artillery and mortars could be heard as the exodus took place. Painda Khan, a Mingora shop owner who lives in the village of Shahgai Saidu Sharif, said that out of his 22-member family, one person has been killed by military shelling and another one is missing. Ten of his relatives fled with him to Islamabad. Khan, who estimates his age at between 65 and 70, told CNN life around Mingora was so desperate, he cannot put it into words. Both he and the 50-year-old man said no food or water remain besides what has been stockpiled. There is no power, and all land lines and cell phones have jammed, and citizens have been confined to their homes by military curfews. Khan said his family left before him, because he wanted to stay behind and protect his home. But the Taliban were occupying a house immediately behind him, and fear drove him out -- despite a curfew -- after that house was destroyed in an air strike. He walked about 40 miles along the banks of the Swat River, he said, then walked another three hours in the mountains south to Malakand. After spending a night in the fields, he said, he continued to Islamabad, about 100 miles away, using public transportation and rickshaw. Shah said he has no issues with the military operations, but doesn't understand why civilians have to suffer as a consequence. Over the past two years, he said, the majority of casualties in Swat have been civilians -- some 2,700 of them. CNN was not able to independently confirm this toll with the Pakistani military. The 50-year-old blamed both the Taliban and the military, saying it seems they are both enemies of the people. The Taliban, he said, are using locals as human shields and infiltrating the civilian population, shooting from in their midst. In retaliation, the army fires back indiscriminately without differentiating between militants and noncombatants. As a result, he said, civilians make up the majority of the dead. The Taliban takes over any houses vacated by civilians, he said, as well as their possessions. The Taliban are ruling the Mingora area by fear, he said. Anyone who speaks up against them or does anything the Taliban doesn't like gets killed within a day. Civilians' bodies are left in the center of town, he said, with a note warning the Taliban is watching and anyone who tries to remove the body before a time specified in the note will be punished. Taliban fighters and checkpoints can be seen in every village. The Taliban has seized all civilians' guns and ammunition and planted mines in the roads, he said. Some former Mingora residents are helping the Pakistani military identify Taliban hideouts in the valley, Khan said.